A vegetarian chili recipe is a perfect choice for your low glycemic plan. All the beans, legumes and vegetables in it are low glycemic and it is a powerhouse of fiber and nutrition. To lose weight and keep it off - fiber is what you need and beans are high in soluble and insoluble fiber. The American Dietetic Association recommends that we eat 25 grams of fiber every day. A half cup of kidney beans will give you 20.5 grams of fiber! This means chili is the perfect recipe for those of you who are on your way to your ideal goal weight and you want to stay there. 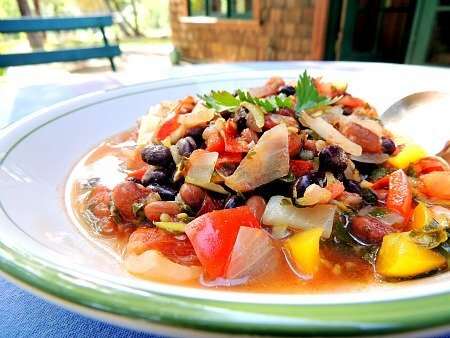 This is truly a nutrient dense dish that packs a lot of fiber with the beans and vegetables. Corn is great in chili too especially when scraped fresh off the cob. It really enhances the flavor and will not raise your blood sugar with a glycemic load of only 9. If it's not in season buy frozen corn. This is a super fast chili to make if you use canned beans and tomatoes. If you have the time however, using fresh tomatoes, beans and corn will make an amazing taste difference. It's one our printable low glycemic index recipes. Use more chili powder to taste if you like a hotter chili. Sauté onion and garlic in oil until soft about 5 minutes. Add vegetables except for tomatoes and parsley. Sauté another 2 or 3 minutes. Add tomatoes and parsley. Add beans and simmer for 30 minutes. It will really make this dish special if you cook your own beans, but if you don’t have time to do that by all means used canned beans and canned tomatoes and you will still have a fantastic, low glycemic, vegan chili recipe. Beans are a great source of fiber, protein, minerals and even antioxidants. The best diet foods are high fiber foods and beans are perfect for that. Beans lower your cholesterol, stabilize your blood sugar and they're extremely filling. Eating 1/2 to 3/4 cup of beans every day has been shown to significantly improve blood sugar control. Serve this vegetarian chili with a green salad and sprouted grain toast for a very satisfying lunch or dinner. You can double the recipe and freeze the leftovers for several easy dinners. Return from Vegetarian Chili Recipe to Low Glycemic Recipes. Return from Vegetarian Chili Recipe to Lifetime Fat Loss home page.